Why do young people volunteer? What is the best part of youth work? Seeing the young people grow! When I said that, did a name or face come to mind? Growth in leadership, character, decision-making, maturity, communicating – any and all - are signs that a young person is prepared for their future. Recently, I saw a strong team of dynamic high school students reflect on their own growth during a volunteer leadership experience. The 26 members of the Minnesota 4-H State Ambassador team led a four-day youth leadership conference, YELLO!. At that conference, 230 young people learned about themselves and how they are part of the bigger picture. This same concept was the theme of what the State Ambassadors themselves learned in the year leading up to this conference. During the year, the State Ambassador program made a big impact on each team member. Natalie Rusk talked about the role social emotional learning played while youth participated in a program. One huge take away from her talk for me was the idea that knowing and managing your behavior and emotions affects your ability to achieve goals. She talked about this awareness as an important skill. And she followed my thought process with another comment about how youth programs are a great setting to learn this. The tight-knit group of youth ages 16-19 were in many cases strangers just 11 months earlier. Not only did they learn about themselves throughout the year with activities such as StrengthsFinder, they also learned about themselves as a member of a larger team through conversations about who they are and what they bring to the team. 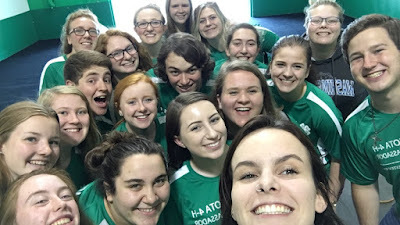 At the end-of-year reflection for the State Ambassador team, I heard youth talk about what they got out of the program -- much more than what they gave to it. Which leads me to ask, “Why do young people choose to volunteer, to lead and to give their time? For each of them, their reason is very much their own. But a peek at the research reveals a common theme. DOSomething.org did a study and learned about the importance of friends in volunteering. 76% of young people whose friends volunteered also volunteered. And, more than half of young people who volunteered had been invited to do so by a friend. As a caring adult in a young person’s life, how do you encourage them to gain leadership skills and grow through a volunteer commitment? How do you encourage young people to grow their skill sets? Share a good story about seeing a young person grow! I've also seen this kids in action and it is inspiring to see them give give and give. It's altruistic for me as they aren't padding resumes or checking boxes - they truly want to volunteer. One way I help kids grow in their skill sets is by asking them questions. I try to think about their passions and scaffold questions to draw it out of them. I think questioning, and being genuine about it, is a way for young people to feel comfortable in sharing something unique - and then trying use that experience in a different setting (like a leadership event like YELLO!). Many young people have a lot to share and just need someone to start the conversation. So yes - love the asking questions concept. Another effective strategy is giving young people the environment to practice their skill. I have seen growth when young people are provided with an environment to first co-lead, then lead a small group solo and then watching them grow until they can lead larger groups or a deeper learning experience. For example, at residential camp, first year counselors are paired with a returning counselor. The new counselor learns and practices many skills throughout that time. A bonus - the returning counselor grows their skill set as they model to a newer youth leader. Keep the ideas/strategies coming! Hi! I'm doing a reasearch about volunteering in different countries, so I found your blog post. Thank you for helpful ideas. Let me share mine. I have experience of volunteering in international organizations - Junior Chamber International, Toastmasters, TEDx events. One of the TED Talks (by Tony Robbins) is about 6 core human needs. And reasons why young people volunteer is very much confirms the idea - some students are looking for certainty (1), some - variety (2), many want to be significant (3), connect (4) with others having same interests and grow (5). As they grow and become more mature they become leaders and some of them really become driven by desire to contribute (6), while others are doing it mostly to be significant. Another TED Talk by Simon Sinek shows us the importance of WHY. And int case of volunteering it is very important for organization to communicate the opportunity to satisfy these core needs. When it's done clear and compelling many young people join. To make the message clear it's great to explaine some pathways. So potential members can imagine themselves with the opportunity. I can suggest to look at Toastmasters example, which works since 1905 and has 16,400 clubs in 141 countries. Members improve their speaking and leadership skills. So they grow and become significant. And it goes through the feeling of connection and atmosphere in clubs, which supports overcoming very important barrier - fear of public speaking. So I think if we show our clear WHY and the way to be involved many students join, be able to grow, share, support each other and contribute to communities around them. I have listened to Simon Sinek's WHY TEDTalk a couple of times, but always with the adult learner/professional lens. I appreciate your perceptive of listening to his message with a youth volunteer lens. Young people have so much to contribute, so ensuring they can see a reason to is something us as adults and even other young people can do in our daily interactions with them. Listening to what motivates them and then supporting them. Thank you for your insight!